Indian industries have marched ahead stride for stride with the economic progress. This has led to large scale industrialization and the need to have better infrastructure. The necessity to house huge industrialized complexes has given rise to the need to have cost effective, enduring structures. Karthik Roofings offers some of the most innovative and effective roofing solutions. With a dedicated team of industry experts, Karthik Roofings customizes and delivers solutions that are pertinent. Roofing is one of the big financial investments to be made in a building as it protects the man, machines, materials, etc inside the factory, we at Karthik Roofings ensure that the client gets value and quality, by providing total solutions from designing the roof, supplying to installing. Karthik Roofings provides roofing structures for industrial? warehouses, manufacturing, textiles, food, chemicals, pharma, plastics, packaging, electrical, electronics, engineering industries, logistics, automobile workshops, defense structures, auditoriums, exhibition halls, parking bays and convention centres. With a wide range of designs, sizes, colours and accessories to choose from the client can be rest assured of high quality, durability and impeccable service. 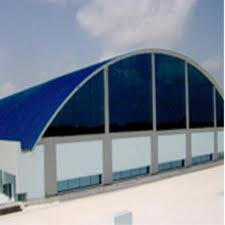 Karthik Roofings uses the best of materials that help in energy saving and provides for a striking building fa?ade. The Self Supported Roofing structurers ?to?profiled Steel sheets ?to accessories such as Turbine roof ventilators, down pipes and gutters, Karthik Roofings can be trusted to deliver superior and safe roofing solutions.